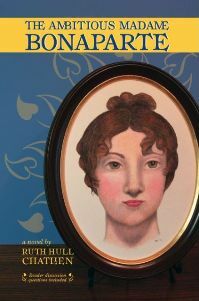 Today I have a historic romance, based on the true story of Betsy Bonaparte, a Baltimore girl who dreamed large, and married the brother of Napoleon Bonaparte. Follow along with the other stops on this tour, and US/Canada residents can enter to win a paperback copy of the title ! Giveaway will follow after the book information: winner will be notified on 13 March and have 24 hours to enter before another winner is chosen. I am a huge fan of historic fiction; and the opportunity to read a story about the lesser-known (at least to me) Bonaparte and his wife was too good to pass up. Elizabeth Patterson was a merchant’s daughter, and far from being the typical woman of her time; she is ambitious and determined, wanting her life to be a European adventure, full of the sophistication and elegance that this image intimates. Throughout the story, Betsy is highlighted as she charms presidents and princes, surprising for she could have been obviously grasping for position, yet her charm and intelligence seem to bring many to her side. Jerome Bonaparte was not someone I was particularly familiar with, yet their relationship was obviously one of love. Throughout the story historical details and information are placed with unerring accuracy to present visual and factual information for readers, enriching the feel, bringing the reader into the age with social conventions, dress, and decoration. Secondary characters are dropped into the text with stories that intertwine with the events of the day, or the characters in equal measure, presenting a solid view of the time with tidbits of information that will spur further investigation. Ruth Hull Chatlien writes with a deft hand, while the timeline may be set by history, the story flows smoothly from one event to another, including one character or another and gives readers a story to enjoy as they find new perspective on characters that have been lost to history. Emotionally impacting, even as the historical events of the day are seamlessly woven through the plot, this is a story that will keep you intrigued and engaged. Before Betsy could answer, it was their turn to take part in the next movement, and by the time they could speak again, she decided not to pursue the subject. She suspected that it was a tremendous breach of protocol for a military officer to wear the uniform of a different branch of service. Clearly, being Napoleon’s brother came with unusual privileges, liberties that the youngest Bonaparte did not hesitate to enjoy. As she pondered these things, Jerome complimented her on her elegant gown. “It is—très à la mode,” he said after a moment of searching for an equivalent English phrase. “Merci, monsieur,” Betsy answered, gratified that he considered her stylish. “Ah, parlez-vous français?” he exclaimed, sounding like a boy in his excitement that she spoke his language. In spite of her discomfort with the indiscreet topic, Betsy found herself joining in Jerome’s laughter. Then, after her first wave of self-consciousness passed, she felt a delicious sense of freedom in being able to talk so openly of things forbidden in Baltimore society. The last move of the dance required Jerome to grasp her hands and swing her through several revolutions. After the last twirl, he flirtatiously pulled her closer to his body than was proper before releasing her. As they pulled apart, Betsy found herself halted. Her gold chain had caught on one of his buttons. She dared not look up at him. With the rapidity of lightning, she felt as embarrassed as if she had found herself publicly wearing one of Josephine’s revealing gowns. Betsy caught her breath at the romantic perfection of the moment, but then her natural skepticism reasserted itself. She perceived that this man to whom she was temporarily joined—handsome, warm-hearted, and fun loving though he might be—lacked the steely resolve of his famous older brother. He seemed content to glide through life feasting on whatever privileges fell to him in Napoleon’s wake. For a moment, he seemed perplexed and she feared the sentiment was too complex for him to understand it in English, but then laughter returned to his eyes. “Truly, Mademoiselle, that is a challenge worthy of a Bonaparte.” He bowed and watched her walk away.